As the discussion around gene-drive modified organisms has intensified to help combat public health issues such as Zika and other infectious diseases, the National Academy of Sciences has convened an expert committee to address a measured approach to research and governance of gene drive technologies. The University of Maryland’s Dr. Lisa Taneyhill, a leading developmental biologist and associate professor in the College of Agriculture and Natural Resources contributed her expertise as a member of the 15-person committee. 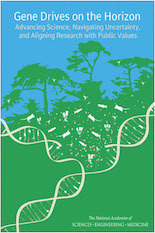 Taneyhill, in conjunction with her colleagues produced a new report from the NAS concluding that gene-drive modified organisms are not ready to be released into the environment and require more research in laboratories and highly controlled field trials. The committee recommends a collaborative, multidisciplinary, and cautionary approach in order to sift through the uncertainty posed by this fast-moving field of study. Gene Drives on the Horizon: Advancing Science, Navigating Uncertainty, and Aligning Research with Public Values can be accessed at: http://nas-sites.org/gene-drives/. An archived recording of the report release event and a four page summary of key findings are also available through this link. Lisa Taneyhill is available for media commentary. Her contact information is contained here.